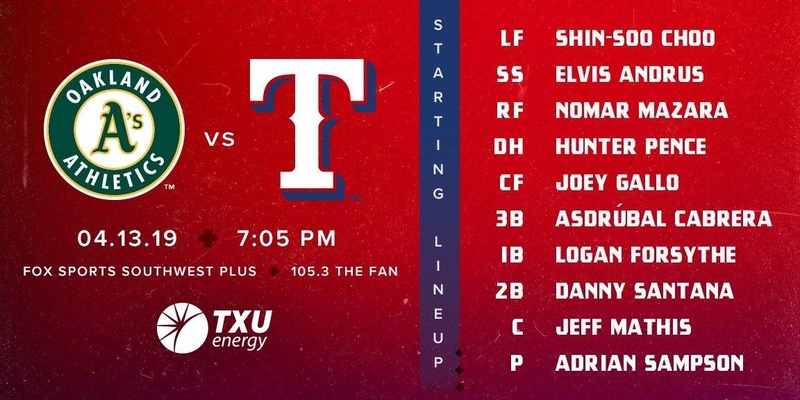 Home » Texas Rangers » Steps. 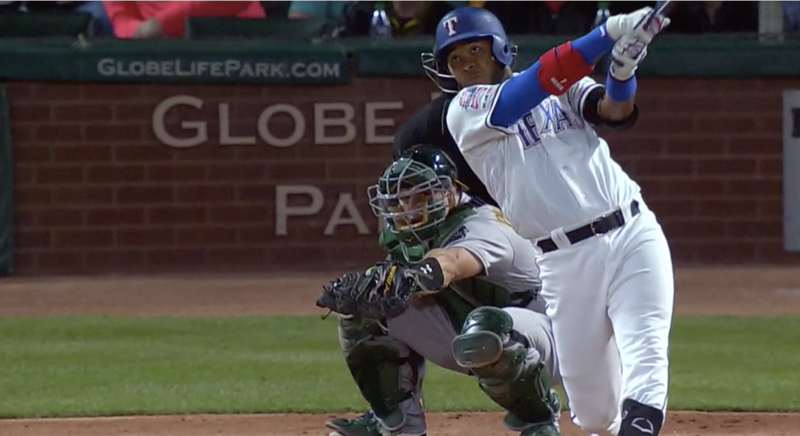 Elvis Andrus connects for a three-run homer in the fifth, putting the Rangers ahead 6-1. The lead didn’t last. Looking at the positives, Drew Smyly pitched his best game of the year. The Rangers offense continued to click at home. And Khris Davis hit only one home run. By the final tabulation in the box score, Smyly wasn’t remarkable or even all that effective. Four earned runs in five innings figures out to a 7.20 ERA. That’s the kind of ERA that gets you out of baseball, or gets you a phone call from Jon Daniels. As is so often the case, one bad inning did in Smyly. But he made it through the first five innings with ease. One earned runs. No walks. Five strikeouts. Just 73 pitches. Nothing like the guy we saw labor through his first two starts. Then the effects of not having pitched for two seasons crept in. He gave up a single to start the sixth, then two walks. And Smyly was done. He left the game with a runner at every base and, unfortunately, Jesse Chavez came in and allowed them all to score. Smyly got fifteen outs from twenty batters this outing, whereas in his last outing he was able to get only ten outs from twenty batters. His efficiency is improving. After the game, he even called it, “a big step forward.” Once the bullpen entered the picture, though, the game took a big step backward. Drew Smyly made it into the sixth. His next step forward is making it out. This season is all about steps. Sometimes they are baby steps. Sometimes they are big steps. And sometimes, like last night, they are stepping-in-a-pile-of-dog-doo steps. The bullpen had to be one of the biggest questions going into the off season and this year. Clap’s main man Chavez needs to get it together. Perhaps Smyly is going to be worth having. It is early still. Looking forward to see what Sampson has over several starts. He improved late last season and was one of the most consistent through the spring and both outings in the regular season thus far. ANYTHING u do not know??????? The problem with rebuilding the bullpen every year as JD likes to do is that it takes a month or two to figure out who stays and who goes and what everyone’s role is, and in the meantime you lose a bunch of games. This year’s crop doesn’t look promising so far even if Leclerc returns to form, and I’m not sure they’ll ever gel into anything trustworthy unless new guys are added. Like I said yesterday, pick any year in the JD era and our deficiencies likely start by beginning every season short handed. It costs us time and games every season just figuring out what we have. And it leaves us even more short handed (and desperate for even a bad-deal trade) if we happen to get to the July deadline with a decent enough record to envision a playoff run. Pick your metaphor… It’s playing solitaire without a full deck. It’s bringing a knife to a gun fight. It’s entering the ring with one arm tied behind your back. It’s no way to run a baseball team! That’s Jake. I appreciate. it. I’ve seen enough of Chavez. He can’t get outs except by “luck” it seems. Ahhh, in Houston Bush waiting for the 4:40pm flt and looking forward to seeing a game tonight. 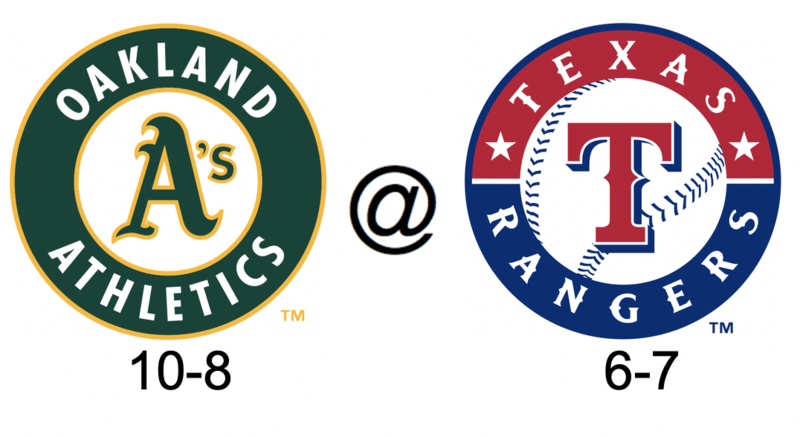 Maybe not a Rangers’ game based on the results I read about here every late night during the cruise but some game, somewhere. Nahhh, like an alkie I’m addicted to the loser behavior of watching our lovable (?) Texas Rangers. At least two of my fantasy golf team players are tied for #1 at the Masters. If they finish #1 and 2 I could win $75 this week with the other 3 guys I have in the top 20. Best wishes–I know you need the money. Hah! Been in this 220+ member group of fanatics for almost 10 yrs and have won $$ exactly once. Which shows my outstanding lack of mastery of fantasy pools of any kind. Only time I ever win anything is at the blackjack tables and that’s only about half the time. Winning half the time is what the laws of probability say would happen, I am pretty sure. Unless you are doing something to skew the results. As in having a good memory and good judgment or just the opposite. You would fit the former characterization. It seems like I remember you saying one time that you earned substantial sums playing poker when you were in college. So, I think you might be modest when you say that. However, you are playing against the house in 21, whereas you might have been playing drunk or stupid college kids when playing poker. It does make a difference. Former Ranger Chris Davis of the Orioles finally broke his drought of at bats without a hit at 55 with an RBI single against Red Sox pitcher Rick Porcello a couple of hours ago. He also ended his MLB record of 62 straight plate appearances by a without a hit by a non-pitcher. 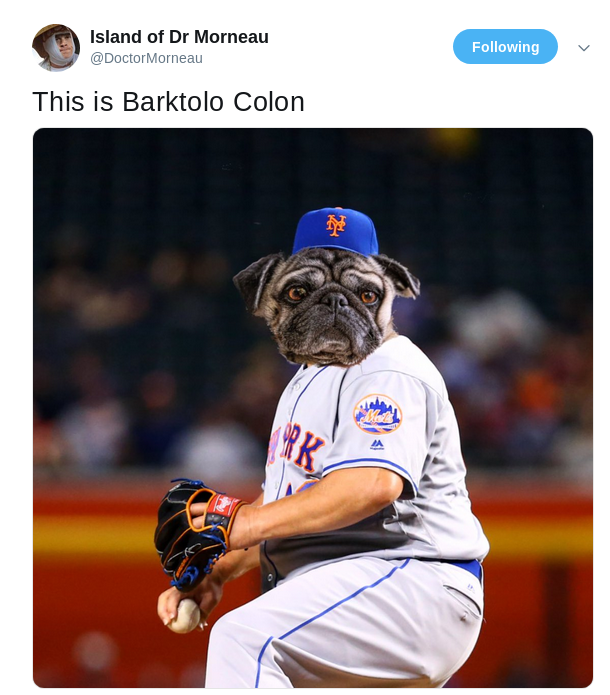 A big mountain to climb out of the Mendoza line for him first! The other Khris Davis is light years ahead of him in batting average and home runs! You have to feel good for the guy. This has been so embarrassing–to be historically bad. And he was once a feared slugger. Can he ever be again? Good article. Kev! My gripe is how awful Chavez continues to be. He allowed every inherited runner to score last night. But he got out of the inning before he could pad his “healthy” 11.37 ERA. I think Chavez needs to be replaced asap. And I also think Woodward should start bringing Martin in first, especially with inherited base runners, and then maybe Chavez could come in the next inning, with a clean slate. But, like the old saying goes, “hindsight is 20/20”. However, based on Chavez’ numbers so far, it seems to me like there should be some “foresight” abilities there as well. Chavez needs to be designated for assignment IMHO! Thanks! I was wondering where he went. Crush Davis 2 for 4 at the plate today for the O’s with 4 RBIs against the Red Sox. Has he got his groove back? Great big congrats to Chris Davis. Don’t read anything in to this, it’s just me being stupid. Odor to 10 day IL. Santana called up. What’s Santana been doing in Nash? Glad you asked. .343 avg, 6 RBIs, .425 OBP in 9G. Crush Davis ends the day 3 for 5 at the plate with 4 RBIs in Baltimore’s 9-5 win over Boston this afternoon. I have tickets for tonight’s game. Anyone in the Arlington area have any weather updates? At a park…..very cloudy…looks like rain…although it has not rained since morning..seen any part of TX LIVE yet? Amazing!!!! Radar clear for now. Expect showers during the game, then weather clears until around Wed. when this all fires up again. It’s raining pretty hard here at 6:35. I made the right choice and now have rain checks and stayed dry and warm at the hotel unlike the rest of the crowd…. ha! ha! An old Aggie football joke, re done! Did you hear about the Aggie that got killed drinking milk? Cow fell on him. Then – Two Aggies were walking down the beach, when a seagull flew over and crapped on one Aggie’s head. So he says to the other Aggie, quick, get me some toilet paper! The other Aggie look at him in total disbelief and says , Are you kidding me? By the time I get any toilet paper, that seagull will be 10 miles away! Good stuff, Jake! I miss those days when we used to hear Aggie jokes almost daily! Keone Kela has given up as many home runs so far this season as he did with Texas last year. Game on FSSW+ tonight. Finally found the channel! The way the radar looks right now, we will be very lucky if this game isn’t postponed for another day. Yep, rain hasn’t been consistent here but it’s not going away. Yes, WKscs, It looks like that system is just sitting there, rotating right though the DFW area, and with no changes in sight for at least another hour or two. Looks like it’s officially been postponed. Postponed until June 8th. Double header. Meanwhile the Stars are in sudden death overtime 1. And neither are pitching all that sharp so far. ← The case against tanking.